All completed films are screened as part of the Austin Jewish Fim Festival; view last year's AJFF films here! Every year since 2005, Austin School of Film has hosted this awesome event wherein Texas high school students (ages 14-19) come together to create short films in only 24 hours during the Annual Youth M.A.F.I.A Day Film Festival. This event takes place starting 10AM at an area school during SXSW. 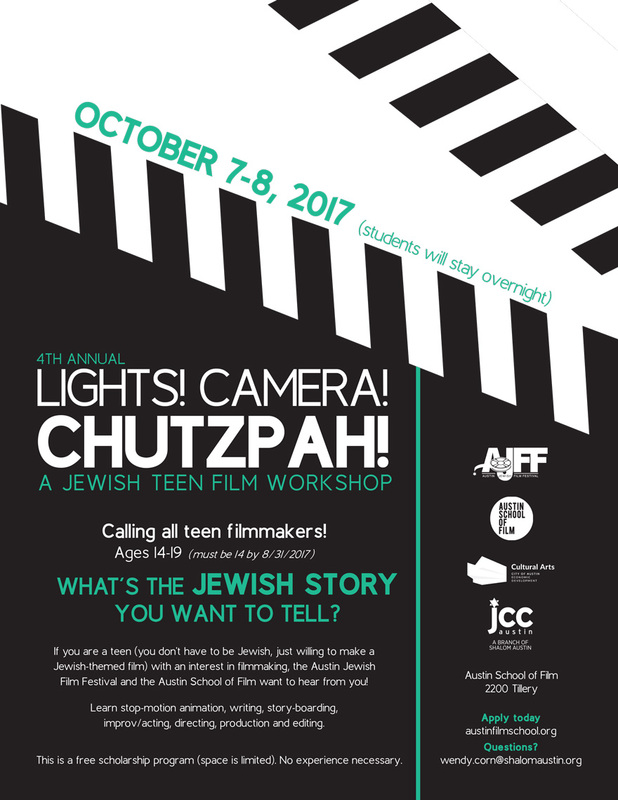 Austin School of Film has also partnered with AJFF to bring together a similar event for their organization that's just as much fun! You and your team will have 24 hours to write, shoot, and edit a short film. You will receive a genre and a prop that HAS to be incorporated into your short film. Your team will be required to have four students. The most recent event took place October 7-8, 2017 at The Austin School of Film... Stay tuned for news about next year's dates! Who will see my film? All finished films will be screened at the Austin Jewish Film Festival. The event will provide Saturday lunch & dinner, and Sunday breakfast in addition to snacks & beverages through out the 24 hours. You and your team will also be able to access the editing labs provided by ASoF to edit your short films. Students will be using iMac computers and have the choice of platforms such as: Final Cut Pro, Adobe Premiere, Adobe Photoshop, Adobe After Effects, iMovie, Garage Band and more. Artist mentors will always be present in the computer lab to offer assistance. Your permission slips will be emailed upon registration; please make sure to bring parental/guardian signed forms on the day of the event. Your AJFF Badge will be picked up the day of the event at orientation. anything else (meds, etc.) you may need to stay comfy for an overnight stay. Producer — Lights! Camera! Chutzpah!